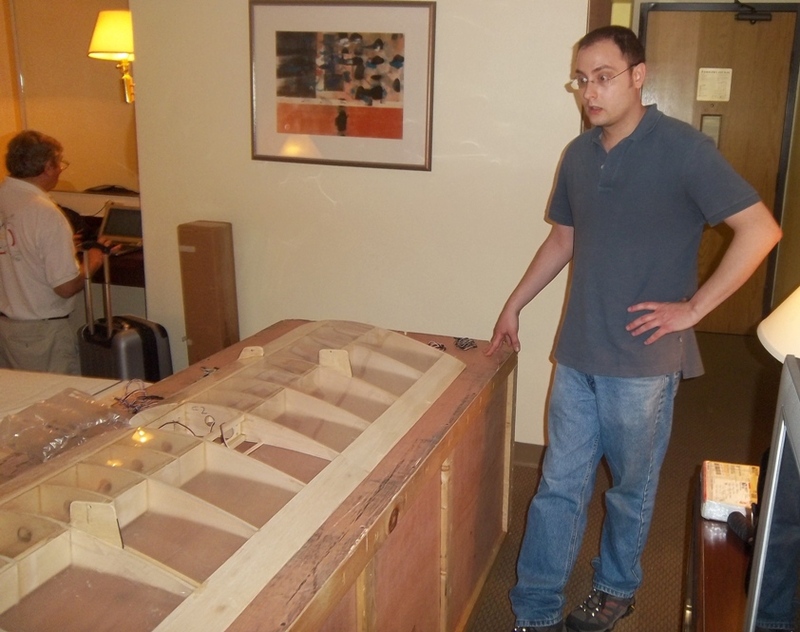 The TEAM and MODEL BOX arrived in Los Angeles, the team via United Airlines into John Wayne airport and the box by Greyhound via most of the southern United States, but arrive they did ~ sort of on schedule. The team rented a van and made rendezvous with your faithful scribe and his van at the LA Greyhound bus station, whereupon the box was loaded and the whole entourage drove through rush hour (hours) traffic to the Van Nuys hotel. 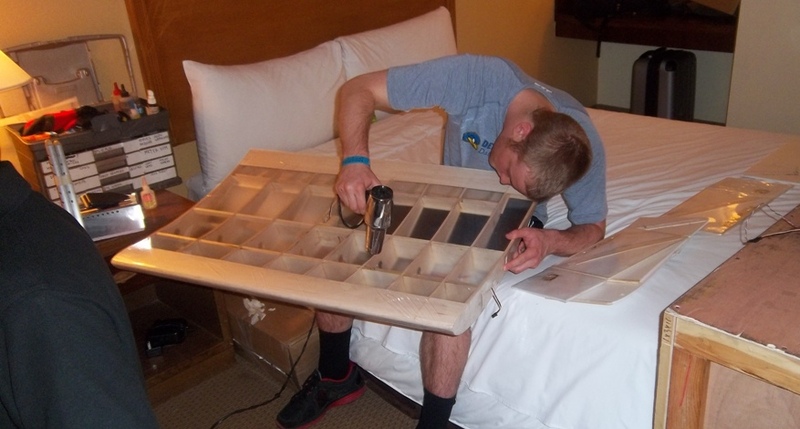 The box and all other boxes previously mailed were reunited and assembled with Dave's tools in their room. Oh yes, a couple of things; the weather was sunny and 80 degrees with the usual low humidity. Matt wore appropriate clothing; Hawaiian shirt and shorts, others struggled with Pennsylvania heavy jeans. Also, since Matt was born a Californian, he led them to In-n-Out Burgers for their first SoCal meal, a very appropriate choice that was well received. The plans for today, Friday, are to make the briefing at ten a.m. and conduct the model technical inspection about two p.m. After that there are other briefings etc. 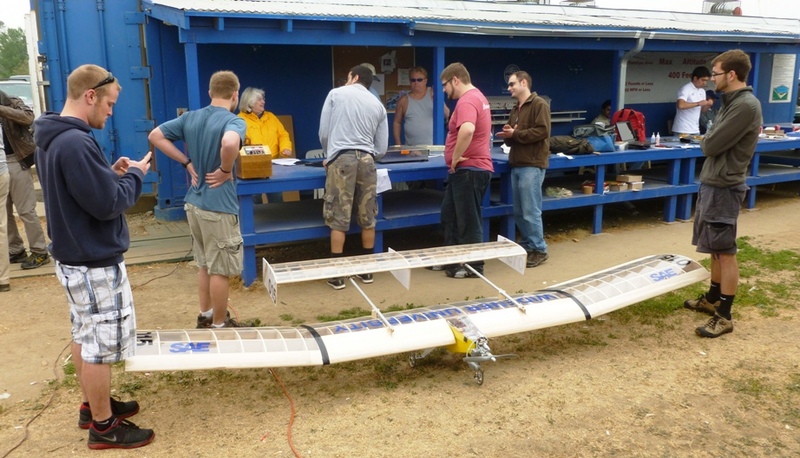 but the team would like to fly the model if time allows. No time for a complete posting tonight. Sufice to say, a very successful day. 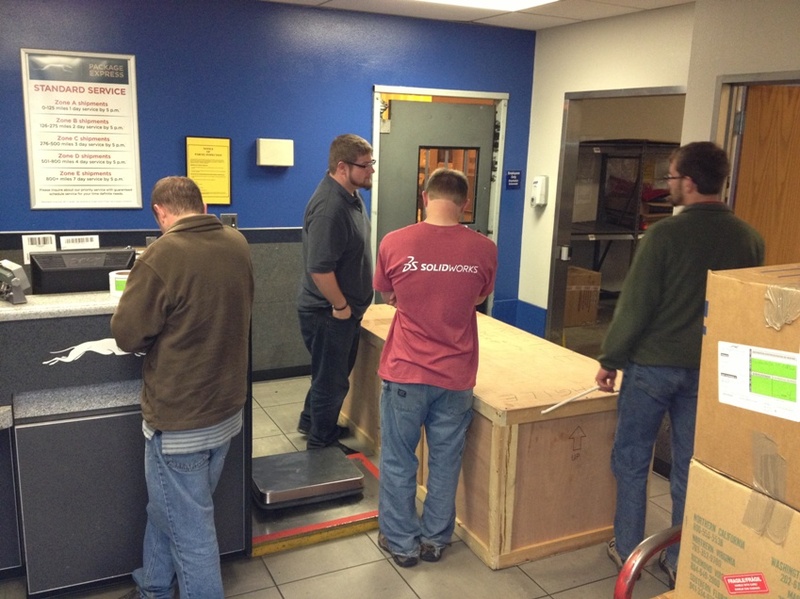 But here are some pictures of the team assembling the model Thursday evening and Friday morning. The briefing went very well as did the tech inspection. With the joy of making it through these hurdles the team decided they needed to make some SoCal cheesecake pictures taking advantage of the California weather and the hotel's lush foliage. 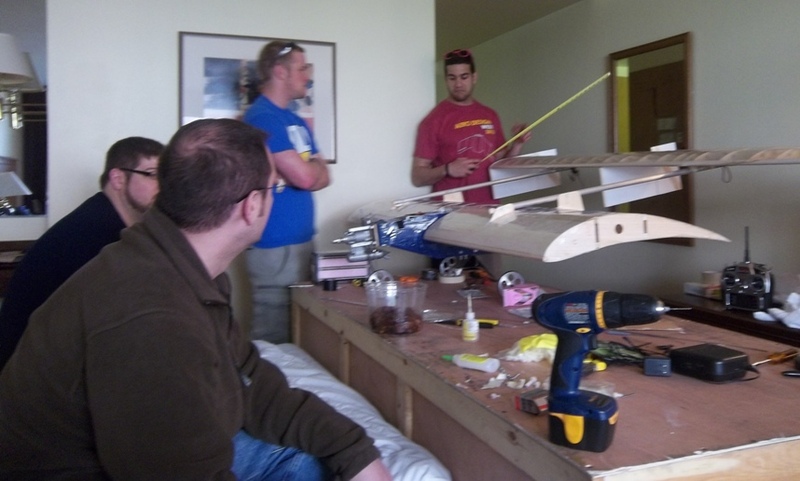 The late Friday afternoon were spent at the flying field preparing the model for flight. It took a couple of hours fiddling with the throttle servo before a change out solved the problem and flight was attempted with the new engine and modest payload. Our initial pilot, recruited by Dave during the AMA Expo in January, was unavailable today so the team had to seek out another one. 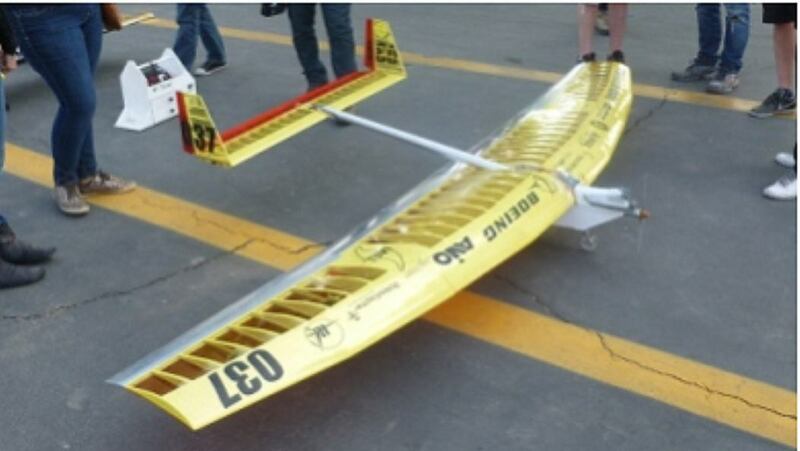 As it happened the young man recruited turned out to be the son of the original pilot, a very experience one in his own right as, among other things, he had flown models at the last four SAE West events. 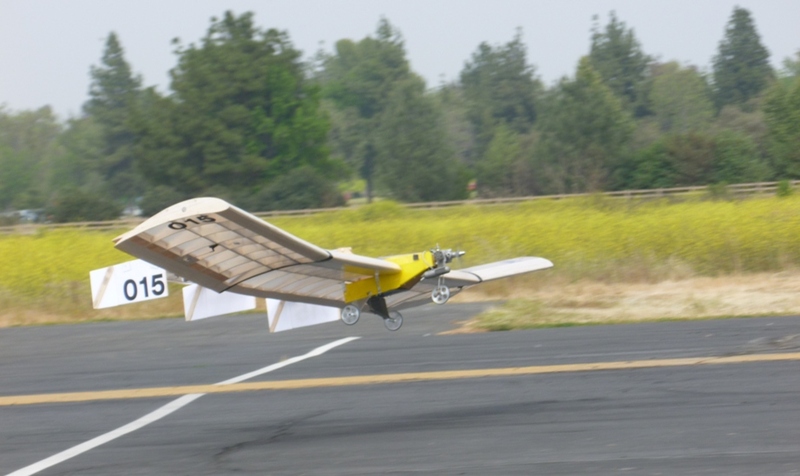 The first flight went very well although the performance was down. but the control seemed adequate as the pilot made a smooth takeoff, turn downwind and then turn to a smooth landing. A second flight was made with a different propeller which had indicated superior performance in a prior analysis. 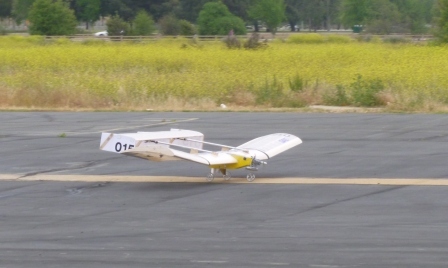 In the event the pilot was barely able to complete the circuit but made a satisfactory landing with out damaging the model. Subsequent engine run indicated the new engine was down 800 rpm over the old one used for all the testing to date. 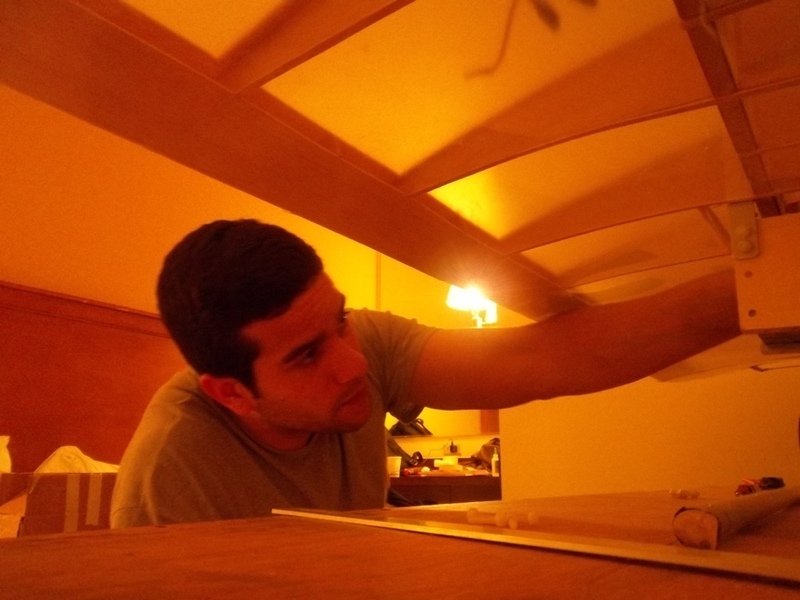 The evening's task is to change out the engine and balance the model laterally; a problem discovered when the pilot asked the team to check it. Tomorrow the real flying begins. This morning the team made the first official flight, an empty weight flight for a bonus score. Flying at this weight had never been attempted before so there was a degree of concern. Then the engine, the old one which had been test run earlier today, refused to start. 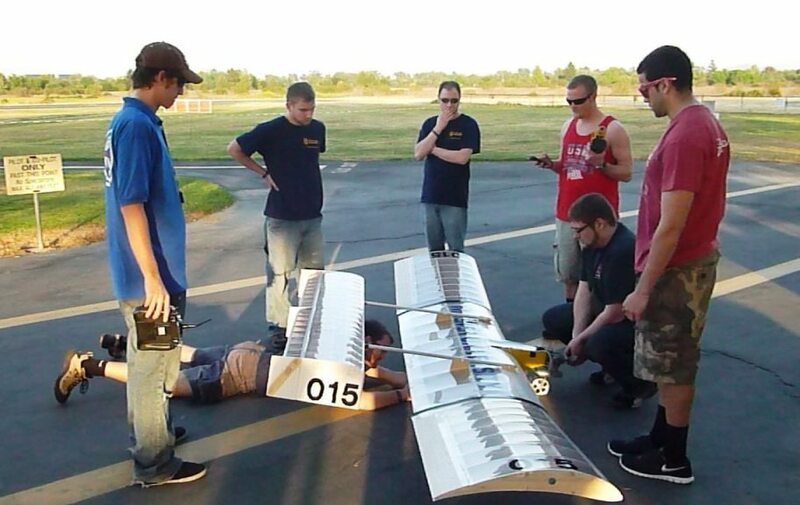 Each team os allowed just five minutes from the call to fly to execute the flight. The model was pulled off the line and the plug changed. That did the trick as it fired and ran ok. But then again, back in line with time running out it refused to start again. I couldn't watch! But fire it did and our pilot did an outstanding job of flying the circuit all the while handling a very sensitive pitch control, or was it instability? However, the old engine did not live up to its Bridgeport power taching at the same rpm as the new motor yesterday; not good for high weight flights. Bob will do some diagnostics before the next flight. Did some engine testing with the same results as last nigh. About 1000 rpm down on the Bridgeport tests. 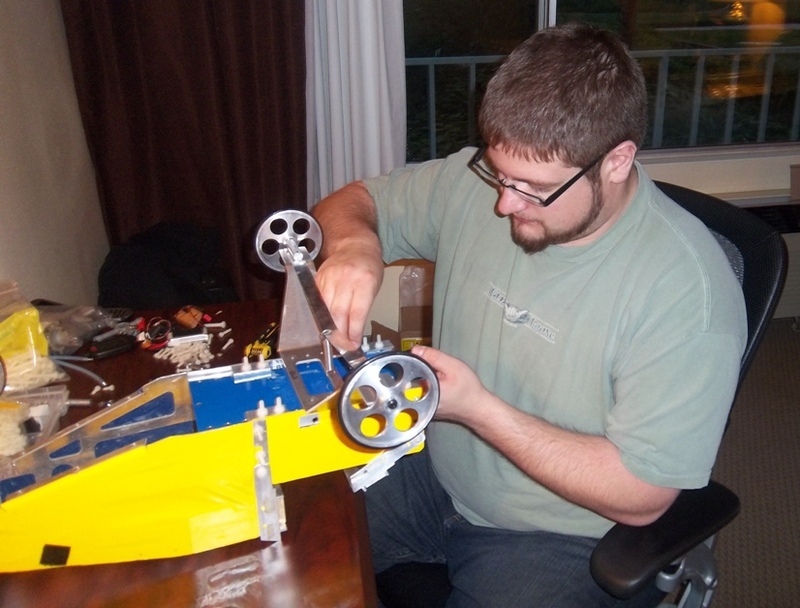 So the decision was to make the next flight with the 14 x 6 prop and 15 lb of payload. The flight went perfectly with takeoff at about half distance, a good climb and excellent landing. The pilot really likes this plane. He said he hopes he doesn't break it. 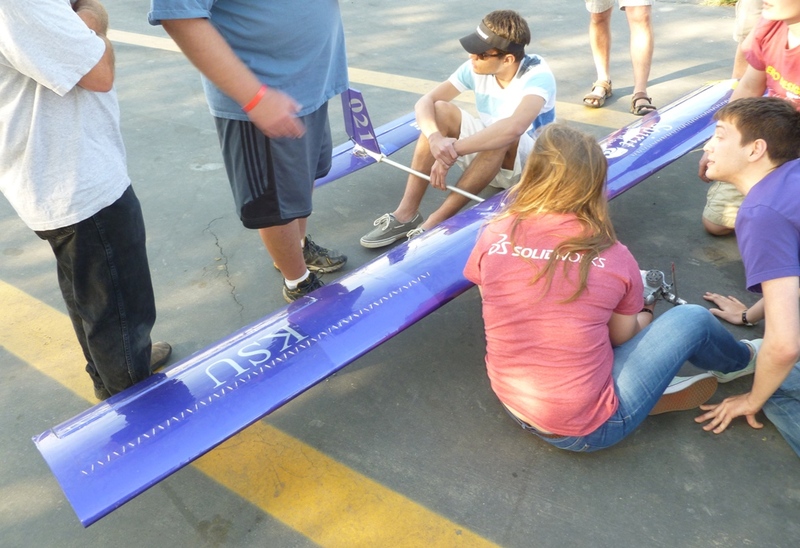 Post flight technical inspection includes weighing the payload. 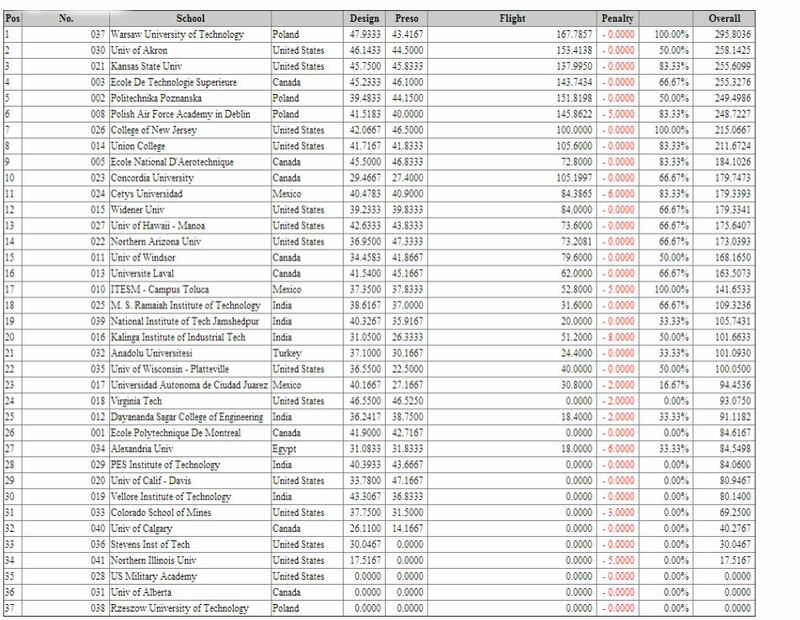 At this time results were posted and the Widener team found itself in eight place. 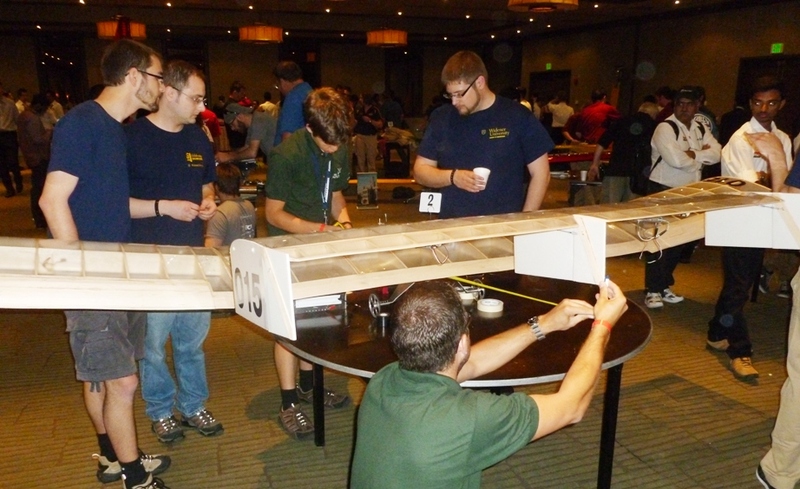 The contest was progressing smoothly to the point that a fourth round was called precipitating a long debate among the team members and the pilot as to what payload should be tried. 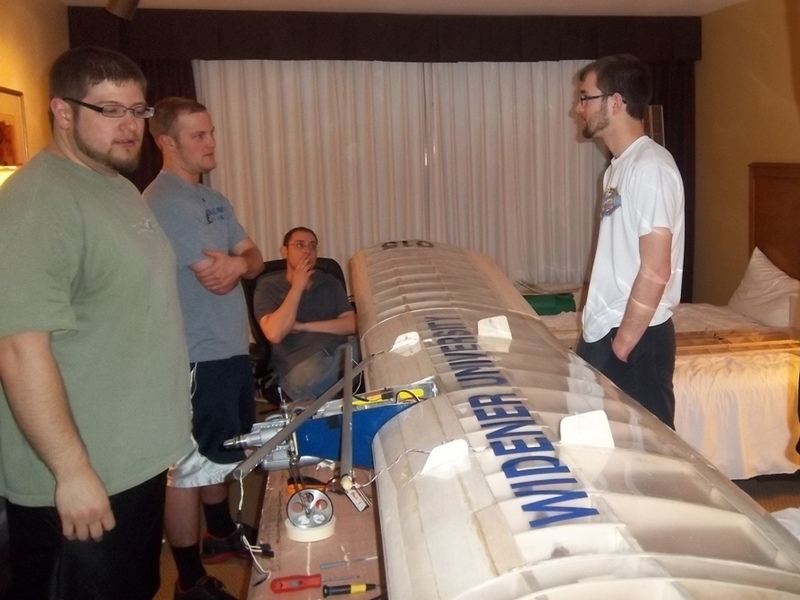 the last flight was made with power to spare so a higher payload seemed possible, but the scoring consists of both payload and reliability, which is a significant multiplier on the payload score. In the end the decision was to go for more payload as the last flight seemed to indicate some more performance margin. Unfortunately it was a step too far as there was insufficient power to climb so the pilot set it down just off the runway with minimal damage which is easily repaired tonight with the spares on hand. 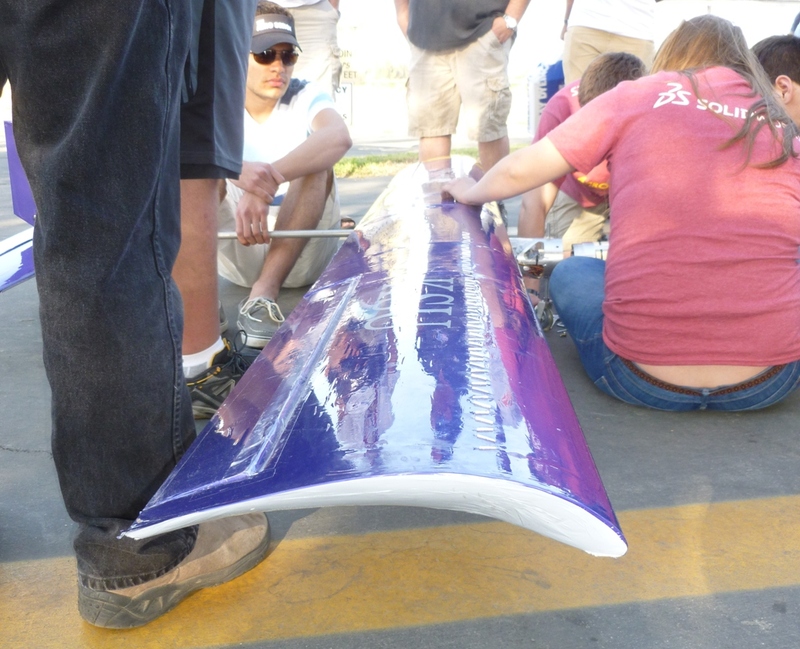 Tonight the model will be repaired and we expect two more flights tomorrow. Flying is scheduled to be completed by noon with the awards ceremony between one and two. 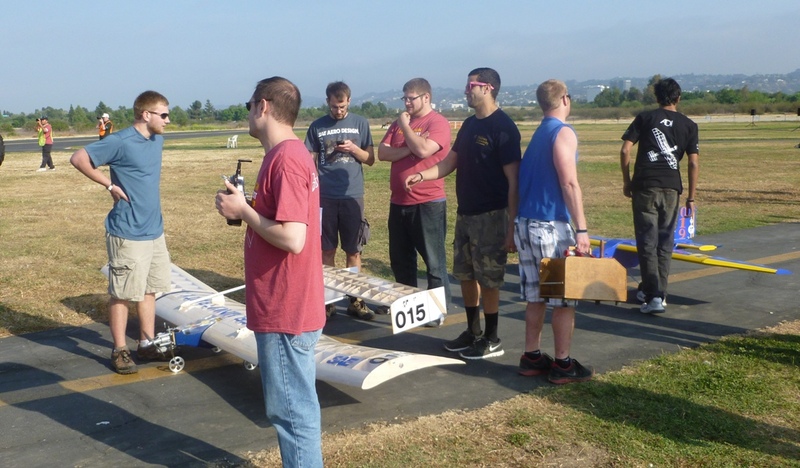 Here are some pictures of the competitors in our "standard" class most of them waiting in line to fly on Saturday last flight. The organizers will make available high quality photographs or all the entries so next year's team can study the designs and thier performance scores as a basis for a new and better design. Here is our team waiting for the final Saturday flight. 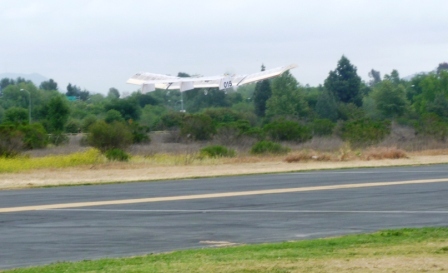 Here is the takeoff for the first flight Sunday, unfortunately it was also too heavy and had insufficient power to climb. It drifted off the runway and the pilot used full control authority to bring it back and set down on the runway only slightly damaging the landing gear. The team is now making the repairs and again switching back to the OS 61 engine, the one that gave the decent results in Bridgeport. More engine tests are on tap and a further discussion of props. Hopefully somewhere in the mix is a combination that will allow a successful final flight with a payload greater than the 19+ of the best flight thus increasing the score. 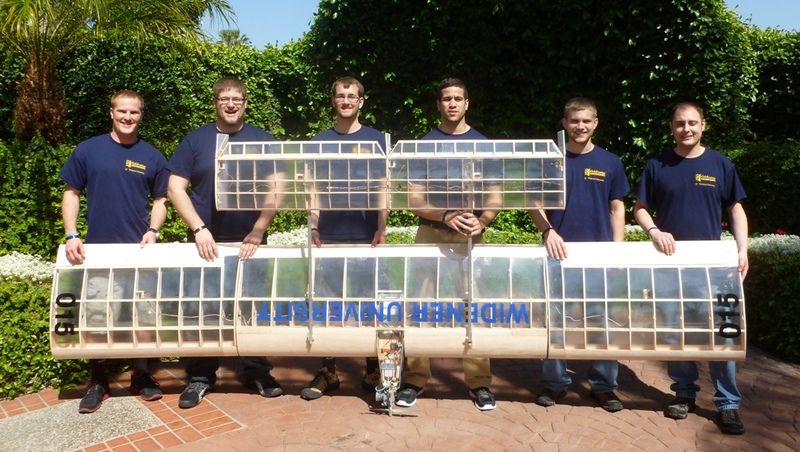 The award ceremony was complete with the Widener Team in twelth place out of 42 entries in the Standard Class. 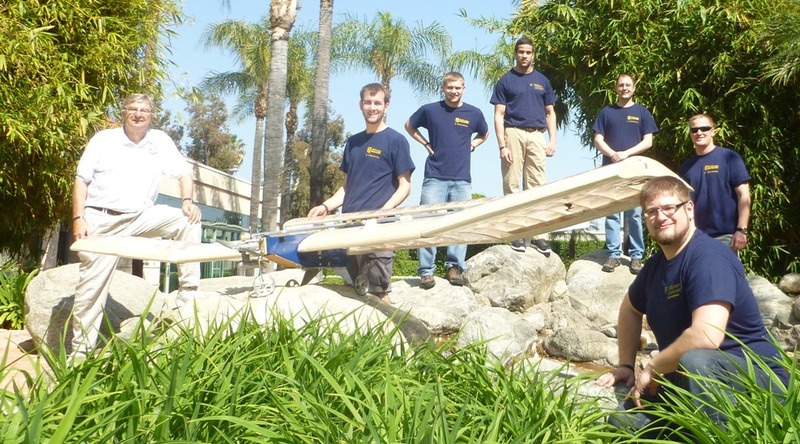 the highest weight we flew was 21 lb. 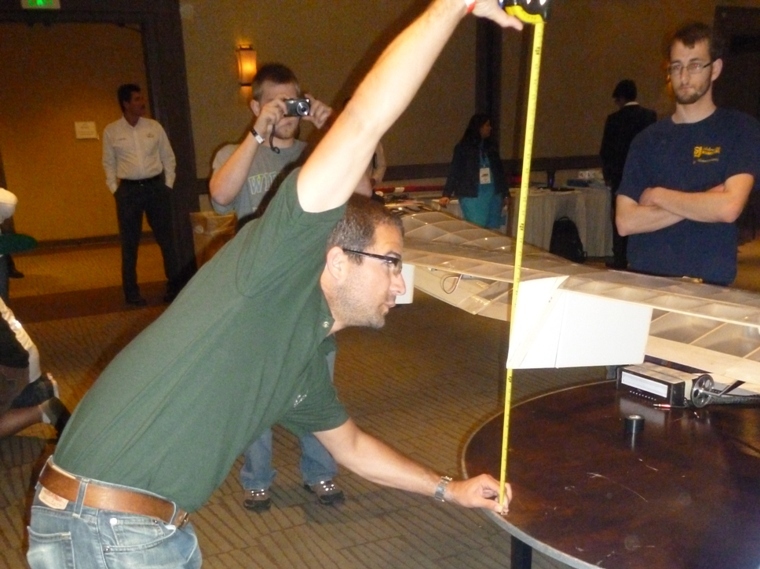 The top three teams lifted more than 35 lb, so that is the mark for next year's team. It can be done! There are many lessons learned that will be transmitted to the 2013/14 team. 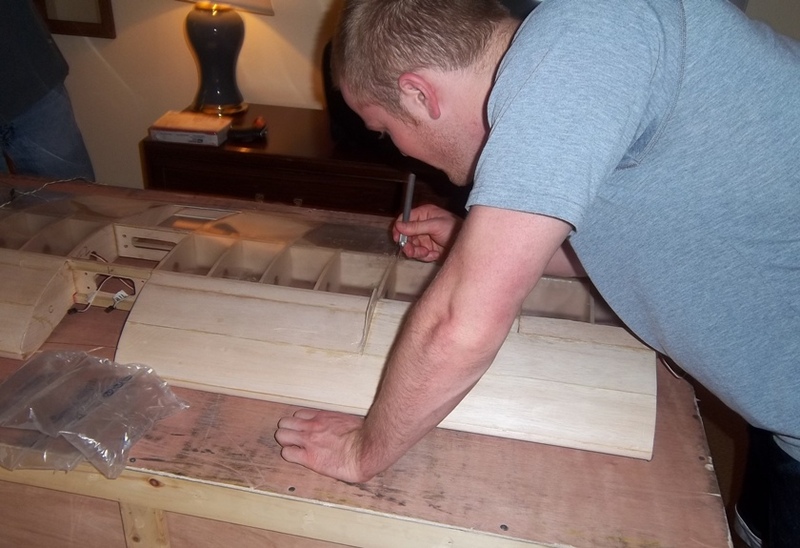 But the work was not yet done as the team had to pack the model parts back into the box then take it to the Los Angeles Greyhound Bus Station for the return trip to Philadelphia. But this went smoothly. Then the team earned a fine dinner and their first view of the Pacific at Gladstone's on the beach in Malibu. Added a video of the first test flight, click here. The winning model from the Warsaw University of Technology. Second Place model from the University of Akron, Ohio. 3rd Place model from Kansas State University. Ok, so how did they do it? We had such problems with our ailerons and they didn't even have dihedral to control with rudders. Note the turbulators on the top of the wing. Were they effective? I suggested our team mark some on wing and tail with a marker!